Research has proven that all of the climbing and jumping our dogs do takes a toll on their joints over time. Because of this research, pet stairs are gaining popularity. More and more pet owners are looking for products to help their dog get onto furniture and in the car, and pet stairs are especially beneficial for dogs with arthritis, leg injuries and small breeds. In this ranking of the best dog steps on the market, we've picked the top stairs for small breeds, large breeds, traveling and more! There are several factors to consider when choosing a set of steps for your pooch. How many steps will you need to access the bed or vehicle? What's the appropriate incline for your dog's size? What material would be best based on the way your dog stairs will be used? Fortunately, there are models available to meet every need. Several studies have found that jumping or even climbing steep surface places a lot of stress on a dog's joints because they're not designed to sustain it (unlike humans). Further, research has also found that climbing and jumping increases the likelihood of developing arthritis. Simply put, dogs who are more active and spend a lot of time jumping up and down from elevated surfaces are more likely to experience joint pain, agility issues or develop arthritis later in their lives. With that being said, providing your pooch with a set of stairs to access elevated areas will reduce the stress on his joints, keeping him healthier and happier in the long run. When considering which dog stairs are right for your Fido, measure your dog and consider his individual needs. Dog stairs come in several different sizes and heights to fit every breed (the overall height and the height of each step), and a number of steps (usually from 2 to 4). Picking the right size dog steps is key. It is vital that you know what size will be the best fit for your pet, or you could end up making things physically harder on your dog. There is no point in providing stairs that do more physical damage to your pet than jumping would. Do your research to find out the exact measurement of pet stairs you're about to purchase. Measure your dog accurately, and then measure all the furniture, vehicles and other heightened surfaces that the stairs will be used to access. It is essential to note the rise or height of each step. For example, regular outdoor or indoor stairs have individual step rises that measure approximately 6.5 to 7.5 inches in height. For the most part, the dog steps you choose should be of a similar size. However, if your dog is recovering from an injury or has trouble lifting his legs to climb stairs, you may need to choose dog stairs with shorter steps. Another thing to consider is the depth of each step. Dogs prefer deep and roomy steps, because they make it easy for them to climb and maneuver while walking up or down. Likewise, some dogs simply fear narrow steps. A good rule of thumb is to be sure that each step has a depth from 10 to 12 inches for the easiest usage. Always make sure to check the weight limit of pet stairs to ensure they will be appropriate for your canine companion. You also want to be conscious of the material your pet steps are made of. 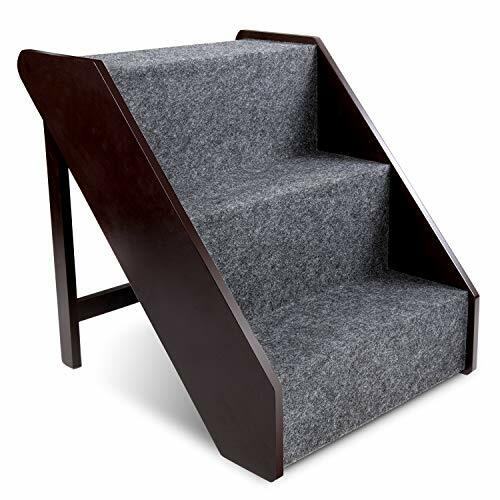 If you have a small breed dog that is lightweight, foam stairs may be a good option for him. Foam steps are also good for small and medium arthritic dogs or those with joint pain. However, foam stairs will buckle under the weight of a large breed dog. For larger dogs, consider purchasing stairs made of metal, plastic or wood. Which Dog Stairs are Right for Your Pup? I've done tons of research and testing in my own home with my own dogs to find ten of the best pet stairs for dogs. This research has helped me to write this buying guide, and I'll be sharing pros and cons of each model from my own first-hand experience. I've picked the best stairs for small breeds, medium and large dogs, as well as options for owners who want pet stairs to take along while traveling with their pet. You'll see that my overall top choice is PetSafe Solvit PupSTEP Plus Pet Stairs. These stairs come in two sizes for small breeds or medium/large dogs. They are lightweight and can support dogs weighing up to 200 pounds. They are a great option for virtually any situation and every dog! Below I'll explain all about the different features of each set of pet stairs, including my top PetSafe pick. Plus, I'll show you some other great alternatives that may be the best option for your pooch and your home. Keep in mind that I have tested dozens of dog stairs, but only my top 10 picks made this list. There are two main types of dog stairs: (1) foldable, which have a compact design and can be used in multiple places, and (2) stationary, that are typically heavy and made to be used in just one location. While safety should always be your first concern when shopping for pet supplies, your dog's comfort also needs to be considered. If your dog isn't comfortable climbing a set of pet stairs, he's going to jump up onto the bed or couch to avoid them. He may also get nervous when climbing the stairs and jump off the side. This could result in serious injury to your pet. The quality of the materials is also important to consider. Are the steps durable? Will they support your dog's weight? You'll also need to consider the safety features that the stairs are equipped with. Are there rubber grips on the bottom to prevent the stairs from sliding around on the floor? Are there sides on the steps to stop your dog from slipping off? Finally, it also comes down to affordability. As with all dog supplies, better quality pet stairs tend to be more expensive. Keep in mind that these products are an investment. If you purchase the appropriate size, high-quality dog stairs will last for many years. I'm not a certified expert on dog stairs, and I'm not associated with any companies that manufacture or sell them. I have been using different dog products for decades, including different pet steps, and reviewing them for nearly 10 years. I have tested thousands of dog supplies, and have lots of first-hand experience with different types of pet products. My experience as a writer covering the pet industry for nearly a decade has also allowed me to polish my researching skills and develop an eye for what to look for in pet products, how to rate and rank them in terms of price-to-value ratio, and other factors that are specific to the type of product I'm reviewing. As we all know, purchasing products for our own pets can be a chore but I've learned how to pick, choose and make smarter buying choices. Quality is always my top concern, but so is the price – I test and then compare the price to the value of the product to make sure that my money is well spent. That's what I bring into these dog supplies reviews, ensuring that our readers do not waste their time or money. For every dog product review and buying guide, I treat it like I would if I were shopping for my own dogs (which I am). It's important to me that my recommendations will last you the reader throughout your dog's lifetime. And, I do not get paid by any companies to write these reviews in order to stay impartial. Everything that you read in this comparison is my honest opinion. These pet stairs are made of a lightweight plastic with carpeting strips on each step. I doubted how durable they would be, but I was pleasantly surprised to learn that they can hold dogs weighing up to 200 pounds! I purchased the large size, but there is also a smaller size that holds pets weighing up to 120 pounds. The large size measures 28″L x 18″W x 25″H when they are set up. The step dimensions are 15″W x 7″D x 6.25″H. The smaller model measures 24″L x 16″W x 19.5″H, and the individual step dimensions are 13″W x 5″D x 4.7″H. 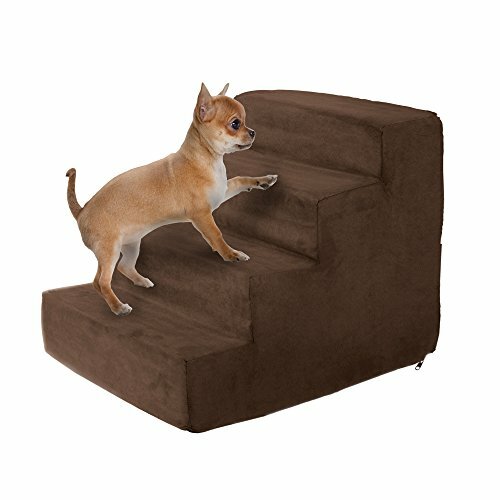 If you have a very small breed (like a Chihuahua) that cannot lift his leg 6.25″ high, these steps won't be a good fit for your dog. If you're planning to use dog stairs in multiple rooms of your home or you want to bring these pet stairs along with you while traveling, the PetSafe Solvit PupSTEP Plus stairs will be your best option.The built-in side rails keep your pet from accidentally stepping over the edge of the stairs. This is an important feature for clumsy puppies and senior pets. Stepping off the side of dog stairs could lead to a broken leg or more severe injury. The carpeting on each step also provides traction to prevent slipping. Another safety feature I was happy to see are the non-skid feet on the bottom of these stairs. If the stairs that you purchase slide along the floor when your dog climbs on them, he may become frightened. This will make it difficult to train him to use the stairs and could result in him becoming afraid to climb the stairs at all. You can purchase the smaller size PetSafe Solvit PupSTEP Plus Pet Stairs on Amazon for $41.95. The larger size will cost you $59.95. As you can see, these stairs are not versatile and safe, they're affordable on any budget. This is why I've chosen to put them in my number one spot on this list. For a closer look and its buying guide, check out my extensive review here or watch the video below. The steps of the Pet Gear Easy Step II Pet Stairs are wider and deeper than most other products on the market. 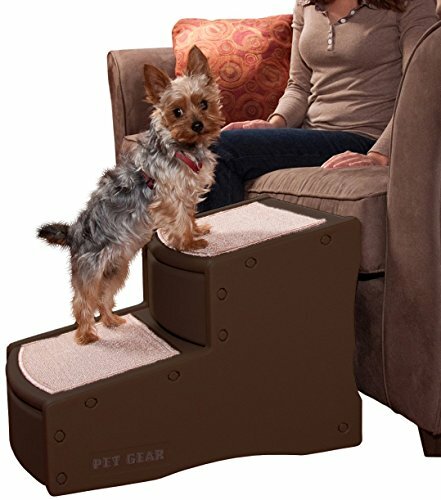 This makes them ideal for senior pets or dogs that are recovering from an injury and may need a wider platform. They are also a great option for dogs that may have balance problems. These stairs do not come assembled, but they do snap together with no tools required. It does take some effort to snap the pieces in place, so if you don't have good upper body strength you may need someone to help you assemble these stairs. You will notice the removable carpet treads in my video guide below. They provide traction for your pup and are machine washable. These carpet treads Velcro on, so I'm not sure if the Velcro's effectiveness will hold up through lots of washing. But, you could always replace the Velcro strips on the back if they wear out. I have washed ours about a dozen times, and the Velcro is still as secure as ever. 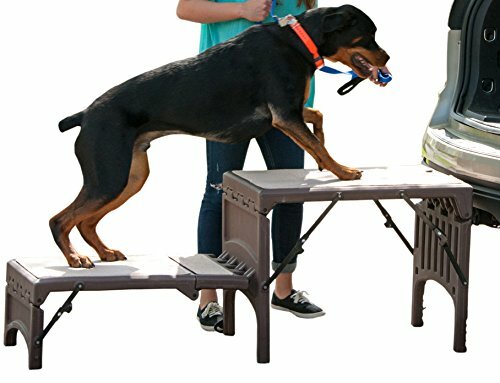 Theses dog steps only weigh 7 pounds, so they're easy to take along with you if you're traveling or you need to move them from room to room. The dimensions of the Pet Gear Easy Step II Pet Stairs are 22.5″L X 16″H X 16″W. The dimensions of each stair are 13.5″ X 11″. Keep in mind that they do not fold or collapse, so if you plan to take them with you while traveling they will take up a good deal of space in the car. 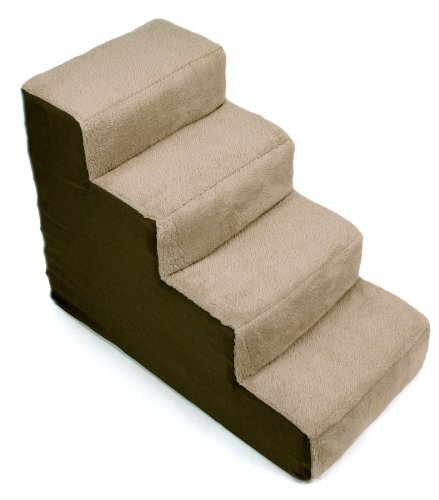 These pet stairs are available in four colors: chocolate, cocoa, sage, and tan. These dog stairs can hold a pooch weighing up to 150 pounds. There are rubber grippers on the bottom of these stairs to prevent them from sliding around when your dog is climbing on them. This is a great safety feature, but I also wish there were sides on the steps that prevented your dog from stepping off. The unique design of the Pet Gear Easy Step II Pet Stairs has a specific incline that reduces the amount of stairs needed, so they are suitable for small or large breeds. However, they are only 16 inches tall, so they won't be suitable for getting into higher vehicles or onto high beds or furniture. Depending on the color that you choose, you can purchase this set of pet stairs on Amazon for $31.99-$34.49. While they may not be suitable for extra large dogs or high furniture and vehicles, they would certainly be good to have on hand for senior pets or pups recovering from injury. 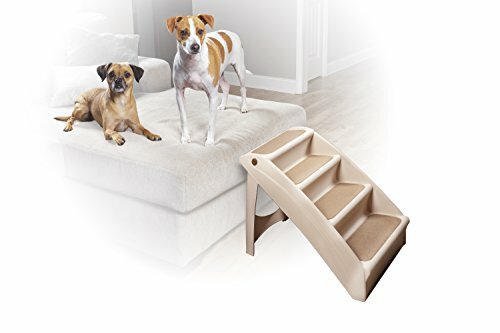 If your dog only needs a couple of steps to access his favorite resting spot, the Pet Gear Easy Step II Pet Stairs are a great value for the money. For more information, take a look at my detailed product review or watch the below video. These steps from Dallas Manufacturing Company are available in 3- and 4-step models. As you can see, I tested the 4-step model. The dimensions of the 4-step style are 26″L X 20″H X 14.75″W. Dimensions of the 3-step model are 19.5″L x 14.75″H x 15″W. Like the Pet Gear dog stairs above, these do not fold or collapse. The dimensions of the individual steps are 7″ deep and 14.5″ wide. The Home Décor Pet Steps are ideal for our Beagle, Molly and our Labrador, Saddie. However, if you have a senior dog or your pup is recovering from surgery, he may not be able to make the 7″ step up. If you have multiple pets and only want to purchase one set of stairs, these steps would be my recommendation. The Dallas Manufacturing Co. 4-Step Home Décor Pet Steps do not have sides on each step. If your dog tends to be clumsy or has issues with balance, you may want to look into an option like the PetSafe Solvit PupSTEP Plus Stairs at the top of this list. Personally, I prefer stairs with sides, just to ensure there are no accidents. The interior structure of these steps for dogs is made of cardboard (you can see it in the photo on the leftt). The Dallas Manufacturing Company claims that these stairs can hold up to 200 pounds of weight. I was skeptical at first, but the unique honeycomb design is strong enough to hold me and Molly at the same time! You can also see the removable cover in my photo. It is made of 100% polyester and is machine washable. The cover also features an easy carrying handle on the back, which makes transporting these dog stairs a breeze. Speaking of transporting, the Home Décor Pet Steps only weigh 6 pounds. If you plan to take these stairs along while traveling or move them from room to room frequently, you won't have any trouble. The cover is also equipped with a non-skid bottom to prevent sliding. You can purchase the 4-step Dallas Manufacturing Co. Home Décor Pet Steps on Amazon for $60.99 right now. You can get the 3-step option for just $39.95. Overall, I do feel that these dog stairs are a good value for the money. However, they are not the safest option on the market. If you're worried about your dog slipping off the side of the stairs, I would recommend checking out one of the other pet stair models on this list. For more details on this one, check out my detailed product review or watch the video below. These are the largest stairs on my list. When set up, they measure 60″L x 23″H x 19″W. This is why they are my top recommendation for helping Fido into a high vehicle. With that said, they are not very suitable for use inside your home. As their name suggests, the Pet Gear Free Standing Foldable Pet Stairs fold up easily. You can see just how easily in my video review below. When folded they measure 30″L x 19″W x 8.5″H. They can easily be stashed in a closet or the back of a vehicle. The dimensions of the individual stairs themselves are 28″L x 19″W. If your dog frequently jumps into your pickup truck or SUV, these dog stairs will make things much easier for him. They are high enough to get into a vehicle, and the individual stairs are large enough for any breed. Aside from their large size, the Pet Gear Free Standing Pet Stairs are also quite heavy. They weigh 27.5 pounds, which may be too heavy for some people to carry around. But, with the weight comes durability. These stairs for dogs can hold animals weighing up to 350 pounds! These stairs can hold me and both of our dogs at the same time. When I stand on them, they don't buckle or wiggle. The Pet Gear Free Standing Pet Stairs are EXTREMELY durable, and I highly recommend them as an option for the largest dog breeds. You can see the rubberized bottom grippers in my video review below. They prevent these stairs from sliding around underneath your pet when he's climbing on them. The removable carpet treads also provide traction on the stairs, and they're machine washable for easy cleaning. As I mentioned before, I typically prefer to use pet stairs with side rails. Unfortunately, the Pet Gear Free Standing Pet Stairs don't have this feature. However, the stairs are much wider than most comparable products. The need for side walls is not as important with very wide steps like these. Our dogs have never even come close to stepping over the side of these stairs. There is plenty of room for an extra-large breed, like a Saint Bernard or Mastiff, on the Pet Gear Free Standing Pet Stairs. My only concern would be energetic pets that are a little clumsy or senior dogs that are a bit unsteady on their feet. If you decide to purchase these pet stairs, just be sure to watch your pup carefully when he climbs them. These are the largest and most durable pet stairs that I have ever seen. The folding feature makes them quite convenient, despite their heavy weight. While they are one of the highest quality products in their category, they are also one of the most expensive options on my list. You can purchase them on Amazon for $177.11 at the time of this review. Many pet stair models sell for less than $50, so I know it seems like these are much more expensive than other options you might have in mind. However, when you compare the durability, convenience and size of these stairs, I believe they are a good value for the money. For more information on these stairs, read my full product review or watch the video below. The Majestic Pet Products Pet Stairs are available in 3- and 4-step models. As you can see, I tested the 3-step option. They measure 18″L x 15″H x 16″W. The 4-step model has dimensions of 24″L x 20″H x 16″W. The step dimensions for both sizes are 16″W x 6.5″D. These pet stairs are made for very small dogs. Our 28-pound Beagle, Molly, is almost too big for them. When Molly's front paws are on the stairs they push down just a little. When all of her weight is on the stairs, they buckle quite a bit under her weight. Unfortunately, they are only 15″ or 20″ high, depending on the model that you purchase. They barely reach our couch, and are not tall enough to allow our dog to climb on our raised bed. Be sure to check the height of the platform your dog needs to access before purchasing these stairs. Majestic Pet Products Pet Stairs weigh just 7.4 pounds, which means they are easy to move around from room to room or take along while traveling. The inside is made of sturdy foam. 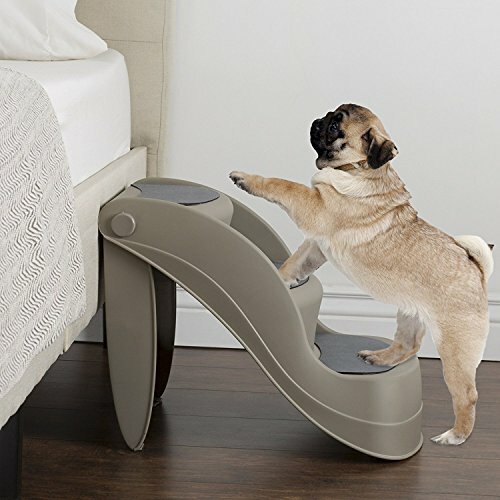 While the company does not offer a weight limit or recommendation for these dog stairs, I would only recommend them for dogs weighing less than 30 pounds. As long as your pup doesn't weigh more than 30ish pounds, these stairs would work well. However, if your dog weighs more than 30 pounds I would recommend looking into one of the other options on this list that are made of plastic, wood or metal. The removable cover of the Majestic Pet Products Pet Stairs is machine washable for easy cleaning. These stairs are designed and assembled in the United States, but they use imported materials. They are available in: Black Velvet, Chocolate Brown, Gray Velvet, Navy Blue, Rust, Stage Green, and Stone. You can purchase the 3-stair model on Amazon for $44-$76.99 depending on the color you choose. The 4-stair model is available for $57.95-$92.38. For the quality of the product and the fact that they are made of foam, this price is a bit high. They are soft and well padded, which would be good for dogs with arthritis or pets recovering from an injury. I would only recommend these stairs for dog owners looking for a soft set of steps for a small dog. 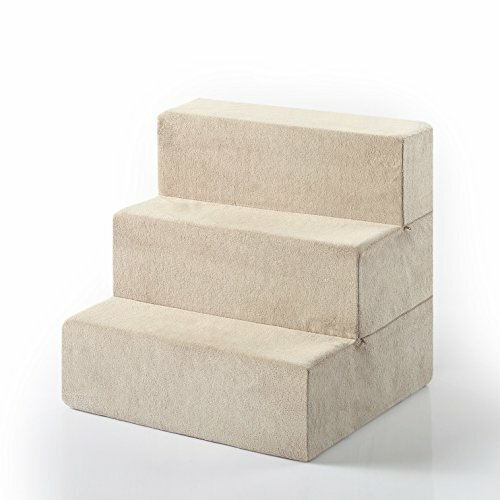 These canine steps are made with high density CertiPUR-US Certified foam. The foam is covered by a removable soft cover that is machine washable for easy cleaning. They are lightweight, too. The X-Large size weighs less than 7 pounds, making these stairs a good option if you plan to move them frequently. The foam in Zinus Comfort Pet Stairs is a little more sturdy than the foam in the Majestic Pet option above, but it's still foam. Remember that although the sizes are referred to as ‘Large' and ‘X-Large', these stairs will not be suitable for very big dogs. While the company doesn't offer a weight restriction, I wouldn't recommend the largest size for a dog weighing more than 50-60 pounds. One drawback to these stairs is that they do not feature a non-slip bottom. They also don't have side walls on the steps. As far as safety goes, these stairs aren't the best. However, if they will be placed on carpeting there is no worry of the stairs sliding underneath your dog. If you're looking for a set of foam pet stairs that are more dense than the Majestic Pet option above, Zinus Comfort Pet Stairs is a good option. Like the Majestic Pet stairs, these are affordable on any budget. Depending on the size that you choose, they are selling for $25.20-$48.99 on Amazon right now. Another foam pet stair option, the PETMAKER High Density Polyurethane foam Foam Pet Stairs are available in 3- and 4-step options. They have a high-density foam interior and a soft, microfiber cover that is 100% polyester. The cover is removable and machine washable. The cover also features a non-slip bottom. The 3-step model measures 16″L x 15″W x 12″H. The 4-step option has dimensions of 21.25″L x 15.25″W x 15.75″H. Both models are only recommended for dogs weighing less than 25 pounds. The price of these stairs for dogs varies depending on the size and color that you choose. At the time of this review, you can buy the PETMAKER High Density Foam Pet Stairs for $29.95-$54.95. 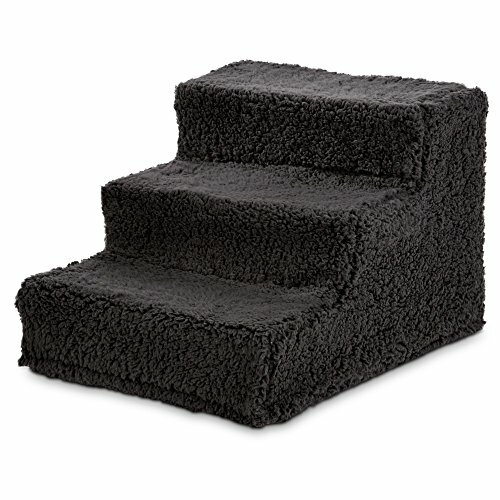 They are comparable in price to other similar foam pet stairs. If you have a small dog, these stairs are definitely a good value for the money. If you've been reading through this list of the best dog steps and thinking that your dog needs something more sturdy than our previous options, the Arf Pets Wood Dog Stairs may be the right option for you. These stairs have a sturdy wood construction and a folding design. They come in a beautiful espresso color that will match virtually any home's décor. The steps are lined with fabric to offer padding and prevent slipping. There is no assembly required, but as you can see in the photo on the right, they fold flat for easy storage. These stairs are available in 3- and 4-step options. The 3-step model measures 18″H x 16.5″L x 16″W when standing. They are just 6″ high when folded. The 4-step model are 17″ wide and have an adjustable height from 21.5″-25.5″. This model is also just 6″ high when folded flat. Arf Pets have tested these pet stairs to withstand more than 100 pounds of weight, making them ideal for almost any pooch. Arf Pets Wood Dog Stairs rest flush against furniture, so there is no dangerous gap. In the photo above, you can see the wooden sides on each step, which prevent accidental falls. They even come with floor protection pads for the bottom of the stairs to prevent scratches on your floors and stop the stairs from sliding underneath your pup. These stairs are a little heavier than foam pet stair options, but they still weigh less than 20 pounds. Arf Pets Wood Dog Stairs would be great to take along while traveling, and it would be easy to move them from one of your home to another. You can purchase the 3-step Arf Pets Wood Dog Stairs on Amazon for $54.99 right now. The 4-step option will cost you $99.99. While they are a bit more expensive than foam options, wooden dog stairs are much sturdier and can support more weight than their foam competitors. Arf Pets Wood Dog Stairs are also less expensive than many wooden dog stair options, without sacrificing quality. Plastic dog stairs are more durable than foam options, but not usually as rugged as wooden models. Windaze Pet Steps Nonslip Foldable Pet Stairs are made of tough plastic. Plastic stairs are also easier to clean and more lightweight than similar products made of foam or wood. These 3-step dog stairs measure 17.5″L x 14″W x 14.5″H. They are only recommended for small and medium breeds, but they can support up to 80 pounds. They fold for easy storage and weigh less than 5 pounds. These are definitely one of the best dog stairs if you plan to take them along while traveling. Equipped with safety side rails, the Windaze Pet Steps Nonslip Foldable Pet Stairs are safe for pets. 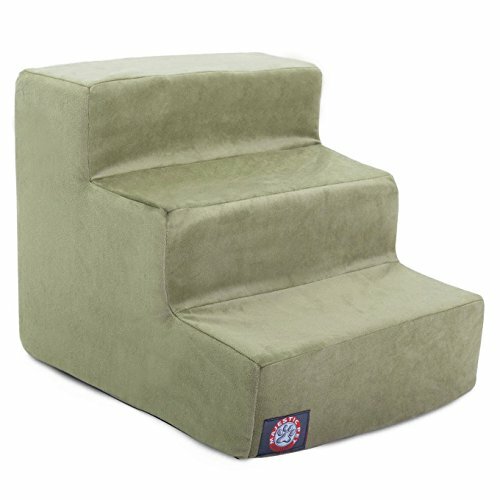 They also feature non-slip foam pads to prevent the stairs from sliding on the floor when your dog climbs on them. Another great safety feature is the lock on the foldable legs. This ensures that the legs will never fold up accidentally while your dog is climbing the stairs. You can purchase these stairs on Amazon for just $34.99. As you can see, they are very comparable to some of the dog stairs on this list made of foam. Plastic is more durable, easier to clean and can support more weight than foam stairs. For this reason, I think the Windaze Pet Steps Nonslip Foldable Pet Stairs are a great value for the money spent. Wrapping up my list of the best dog steps are these unique steps. As you can see in my video review below, they are made of a metal frame that folds flat. Once erected, there are plastic steps that snap onto the metal frame. Finally, the stairs are covered with a removable plush cover that is machine washable. These pet stairs are meant for small breeds. Our 30-pound Beagle, Molly, can't fit her entire body on the You & Me Upsy Daisy Pet Stairs. While their size is small, the company states that they can hold up to 70 pounds. In my video review below I demonstrate how simple it is to put these dog stairs together. It only takes a moment to take them down, and they go up just as easily. These are the perfect set of stairs to take along on a road trip or to use while visiting a pet-friendly hotel. I wish there were more sizing options available, but there is currently only one size on the market. These Upsy Daisy Pet Stairs measure 18″H x 14″W x 12″L, and the step dimensions are 14″W x 6″D. For more information, take a look at my detailed product review or watch my short video review below.